Tech giant, Alphabet, reported earnings which beat earnings estimates which saw the stock rise in after-market trading in the USA overnight. At the US open on Tuesday, the Nasdaq powered to a new all-time high as investors piled into the tech-heavy index. 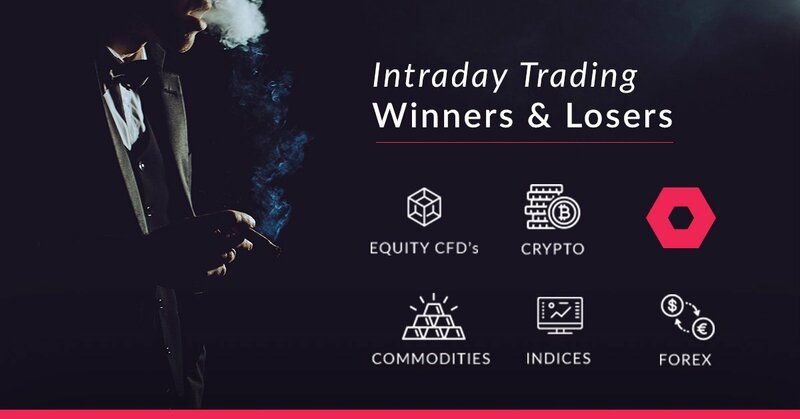 The JSE started off on the backfoot but it managed to reverse those losses and track other global indices higher. 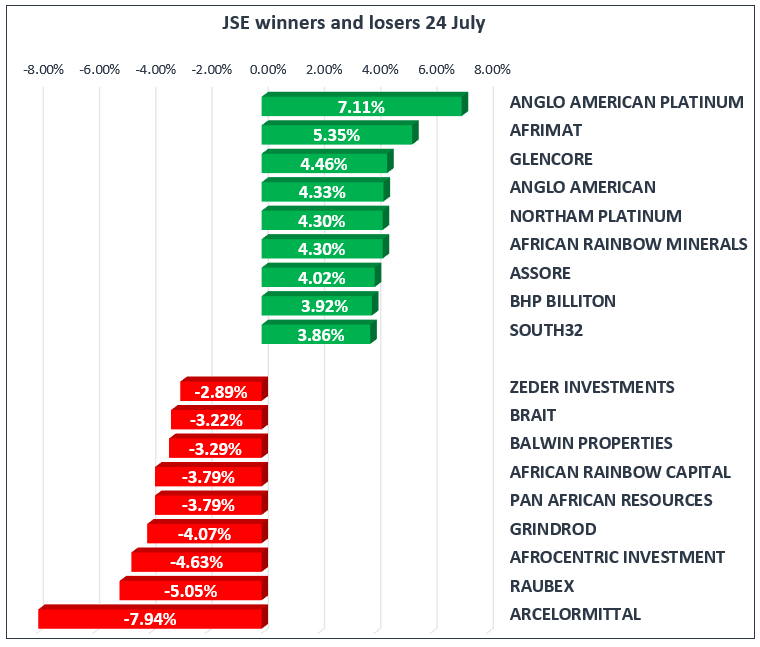 Miners led the gains on the All-Share index were Anglo American Platinum [JSE:AMS] continued on its post-earnings results rally to gain another 7.11%, to end the day at R385.60 per share. BHP Billiton [JSE:BIL] gained 3.92% to close at R297.02, while Anglo American PLC [JSE:AGL] added 4.33% to close at R295.10 per share. Glencore [JSE:GLN] jumped 4.46% to close at R57.40, and South32 [JSE:S32] closed at R36.30 after adding 3.86%. Other significant gains on the day were recorded in Aspen [JSE:APN] which climbed 3.31% to close at R250.93, as well as Discovery Limited [JSE:DSY]which firmed to R167.72 per share after adding 3.53%. Retailer, The Foschini Group [JSE:TFG] added 2.71% to close at R169.58 and Mr Price [JSE:MRP] was 3.16% firmer to close at R231.49 per share. 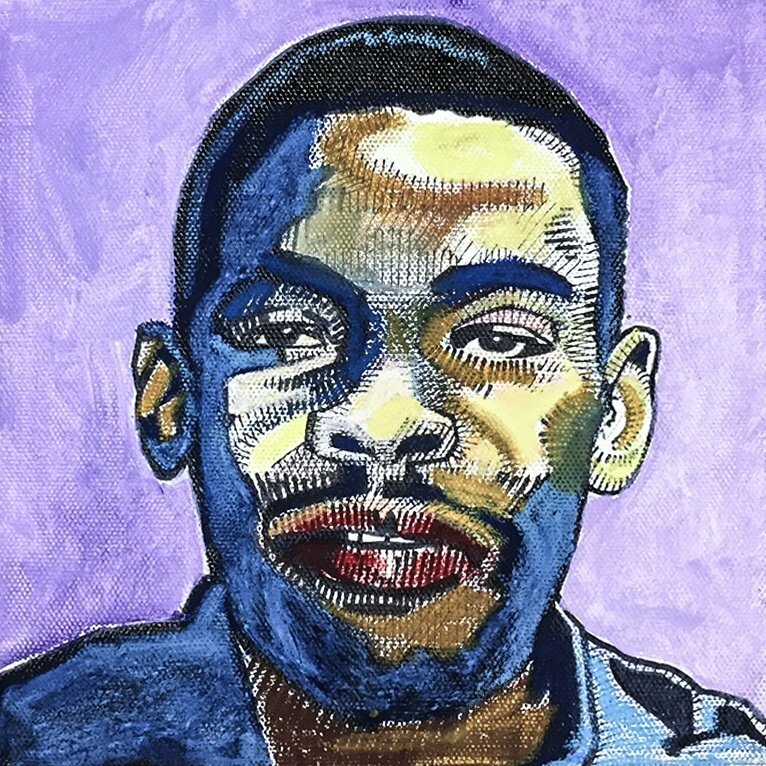 Losses were fairly modest on the blue-chip index were Vodacom [JSE:VOD] retraced for a second consecutive session to close at R125.51 after shedding 2.6%. Rand hedge, Richemont, [JSE:CFR] eased to R115.27 after dropping 1.88%, while Woolworths [JSE:WHL] slowed to R51.90 after shedding 1.8%. Steinhoff International [JSE:SNH] briefly traded below R2 as it reached a session low of R1.92 per share. The stock eventually closed 22.38% weaker at R2.15 per share. Brait [JSE:BAT] weakened by 3.22% to close at R41.20, and Zeder Investments [JSE:ZED] closed 2.89% weaker at R5.04 per share. The local bourse managed to gain momentum and close significantly firmer, which saw the JSE All-Share index climb 0.88% and the JSE Top-40 index gain 1.01%. The Resources index benefitted the most as it rose 2.64%, while the Financials and Industrials indices added 1.22% and 0.12% respectively. The rand strengthened to a session high of R13.28 against the greenback following the news of a significant investment into South Africa by China. The rand was trading 1.14% firmer at 17.00 CAT to be recorded at R13.29/$. Gold opened weaker on Tuesday but it clawed back to eventually trade in the green as the US dollar retraced. At 17.00 CAT it was trading 0.33% firmer at $1228.37/Oz. Platinum was trading 1.35% firmer at $843.40/Oz while Palladium was up 1.03% at $924.39/Oz. Brent crude advanced in today’s session as investors were anticipating a draw in US stockpiles data. The commodity was trading 0.79% firmer at $73.64/barrel just after the JSE close. At 17.00 CAT, Bitcoin was trading 5.86% firmer at $8165/coin, while Ethereum was up 2.36% at $472.88/coin.